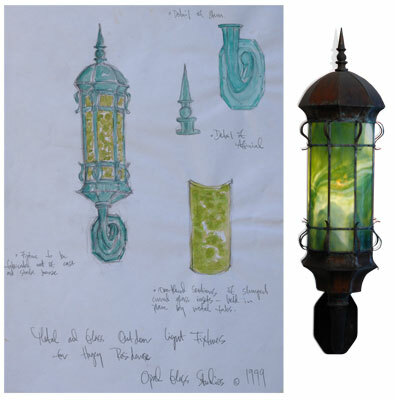 Sharon has been involved in designing and creating unique and distinctive lighting pieces for many years. She began with multi pieced glass lamp shades that are created in the copper foil method pioneered by Louis Comfort Tiffany. Designs have included, grapes, jungle foliage, floral, and unusual themes such as African masks. She has combined her bronze casting skills to produce completely integrated lamp bases to support table lamps. She has also designed and fabricated 4 sides panel lamps of organic and geometric design. Another lighting project was the production of 10 massive cast bronze, fabricated copper and bent glass exterior lights for a mansion in Kenwood. She has also collaborated with her brother , a glass blower to produce wall sconces set into metal housing. So the possibilties for unusual lighting are limitless.